Have you ever dreamt of peering through a telescope into our magnificent stars? That dream is within your reach. Emeryville, CA, November 07, 2017 --(PR.com)-- With the Stargazers App, users can look through telescopes across the world from the comfort of their home, no matter the weather or time of day. The user's tablet or computer can live broadcast video or photos of their explorations as well. On November 5, 2017, Stargazers.Space launched a Kickstarter campaign to fund the Stargazers App. The Company must raise € 50,000 to complete the infrastructure that will allow any user to watch the stars: https://www.kickstarter.com/projects/stargazers42/stargazers-app-touch-the-sky. Once Stargazers.Space complete this Kickstarter campaign, they will finish construction of the first two observation sites, located in Victoria State, Australia and Provence, France. Stargazers.Space welcomes any amount of support for this Kickstarter campaign. For as little as € 3, Stargazers.Space will include the backer name forever on Stargazers App backer’s page. For € 10, a backer receives three months’ access to all live streaming, in addition to other rewards. For more information on Stargazers.Space Kickstarter campaign: https://www.kickstarter.com/projects/stargazers42/stargazers-app-touch-the-sky. The Company goal is to make the Stargazers App the most innovative, simplest, and affordable telescope remote control solution available on the market. Stargazers.Space ambition is to make astrophotography as simple as the camera on a cell phone – just point their telescope and shoot. With the app, a user will be able to see what each telescope is seeing. With Stargazers App and a steering subscription, a user can control the Stargazers.Space telescope. Stargazer’s first two sites were carefully chosen. Because they are in different hemispheres, a user will be able to use the app 24/7 to see the night skies and to safely watch the sun during the day. Over the next 18 to 24 months, Stargazers.Space plans to construct ten observation sites around the world. Each site has been carefully chosen for exceptional views of the sky. No matter the weather or the time of day, any user will find a telescope ready to show him the universe. Stargazers.Space has already completed several steps towards completing this project, even before the Kickstarter campaign begins. They have their own telescopes, cameras and supporting hardware. The Company needs a 32 sqft (3m2) dome to shelter each telescope and solar panels for power supply. The core R&D is complete. App programming for iOS is almost complete. Stargazers.Space will port it to Android as soon as possible. They want to ensure that all apps and back-office support will work seamlessly with the telescopes to give to users the best possible experience. Stargazers.Space was founded in 2016 by four experts in technology and communication. 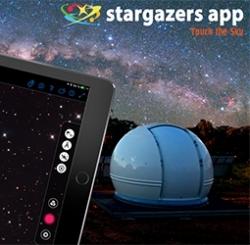 CEO Philippe Lopes Pinto initiated the Stargazers App. He brings experience managing complex worldwide IT projects. Anthony Chollet is a computer engineer with expertise in technical mobility. Community Manager Marc Vittupier is the social media expert and supervises a 25,000-machine system that allows stores to easily scan and mail packages. Samir Ghouti-Terki is the media and acquisition manager. He has participated in creating innovative startups worldwide. Stargazers.Space talented team is passionate about astronomy and bringing astronomy to everyone, including schools. Stargazers.Space’s vision is to revolutionize amateur astronomy, democratize astrophotography, space observation, and encourage knowledge.